Garlic has been used throughout history virtually all over the world as a medicine. Its use predates written history. Sanskrit records document the use of garlic remedies to approximately 5,000 years ago, while the Chinese have been using it for at least 3,000 years. The Codex Ebers, an Egyptian medical papyrus dating to about 1,550 B.C., mentions garlic as an effective remedy for a variety of ailments, including high blood pressure, headache, bites, worms, and tumors. Hippocrates, Aristotle and Pliny cited numerous therapeutic uses for garlic. It only maketh men wink and drink and stink. Another favorite saying about garlic is "Eat garlic and gain your health, but lose your friends." Fortunately, there are now commercial preparations that provide all of the health benefits of garlic without the social consequences. What are the scientifically confirmed effects of garlic? Garlic has a wide range of well-documented effects including helping to fight infection and boosting immune function; preventing cancer, and the cardiovascular benefits of lowering cholesterol and blood pressure. All of these beneficial effects of garlic are attributed to its sulfur-containing compounds: allicin, diallyl disulfide, diallyl trisulfide, and others. Do "odor controlled" or "odorless" garlic products contain allicin? Some do and some do not. Since allicin is the component in garlic that is responsible for its easily identifiable odor, some manufacturers have developed highly sophisticated methods in an effort to provide the full benefits of garlic - they provide "odorless" garlic products concentrated for alliin because alliin is relatively "odorless" until it is converted to allicin in the body. Products concentrated for alliin and other sulfur components provide all of the benefits of fresh garlic if they are manufactured properly, but are more "socially acceptable." 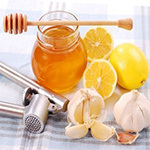 Because alliin and alliinase are very stable when garlic is properly processed, there is a method to ensure that the allicin is not produced until the garlic powder mixes with the fluids of the intestinal tract. This method is referred to as "enteric-coating." This method coats the specially prepared garlic in such a manner so that the tablet does not break down until after it has passed through the stomach. If a non-enteric coated garlic preparation is used, the stomach acid will destroy the majority of the formed allicin. So, these preparations are not likely to produce as good of results as a high quality, enteric-coated product. The same can be said for aged garlic and garlic oil products as these forms of garlic contain absolutely no allicin or allicin degradation products.